Here at Corsia Logistics, we get to transport some of the raddest vehicles, and C4 is no exception. We can’t help but admit how impressed we were with this compact supercar. In this post, we will take a closer look at the history behind Alfa Romeo 4C and the automaker itself to understand what it takes to build such an impressive lightweight car. We will also go over some of the most interesting facts that make this car so appealing, no matter the gender, age, or cultural background. Alfa Romeo wanted to design a supercar that would not only be exclusive in terms of contents and performance but would also be affordable for its fans all over the world. For that reason, the company set a goal to achieve a weight/power ratio of less than 4kg/HP. The first concept of the car was unveiled in March 2011 at the Geneva Motor Show. And then during the same year, it was introduced at the Mille Miglia parade, Goodwood Festival of Speed, and Frankfurt Motor Show. Alfa Romeo officially announced the production of the car in 2013 at the Geneva Motor Show. The 4C came in four paint colors: Rosso Alfa, Rosso Competizione Tri-coat, Madreperla White Tri-coat, and Carrara White Matt. During the same year, the automaker introduced the car at the Essen ‘Techno Classica’, Goodwood Festival of Speed, Moscow Raceway, and Frankfurt Motor Show. The 4C kept winning various awards. In 2013, it managed to win the “Most Beautiful Car of the Year” at the 29th International Automobile Festival in France. Alfa Romeo 4C “grabbed” 41 percent of 100,000 votes cast from more than 50 countries, leaving behind BMW 4 Series, Mercedes-Benz CLA, and Mazda3 (12%). The production of the car began in May 2013. At that time Alfa Romeo depended on Adler Plastic to supply carbon fiber tub. Hence, the automaker estimated to be building a limited edition of over 1000 and up to 3500 units per year. In Europe, the vehicle went on sale for EUR 60,000 (including VAT), which is considerably more affordable than most compact supercars. The automaker introduced its US version of the 4C in 2014 at the New York International Auto Show. Since the car had to meet the US crash regulations, Alfa Romeo made sure to include extra bracing and strengthening to its American model. These changes are the reason why the US version of the vehicle weights a few hundred pounds more than its European counterpart. 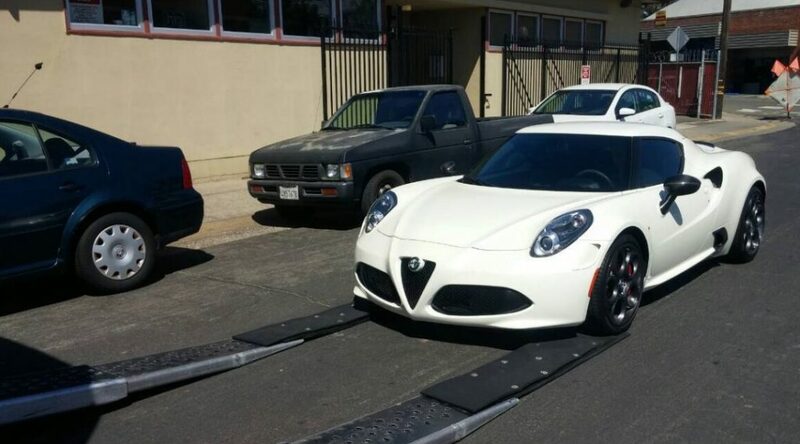 Alfa Romeo 4C (Type 960) weighs only 1973 lb (dry) and 2,315 lb in the United States. Perfect for the road and the track, the 4C is lighter than a city car and has a weight/power ratio of less than 4 kg/HP. How did the automaker achieve that? According to the carmaker’s press release, Alfa Romeo designers “could have focused on horsepower (i.e. : increasing power and performance), but this would have impacted the purchase and maintenance costs, thus making the car significantly less affordable. Available in coupé and spider body style, Alfa Romeo uses a carbon fiber tub. It is significantly lighter than aluminum but stronger than steel. The model has a mainly aluminum subframe, while its skin is made of Sheet Molding Compound (SMC) — a special type of fiberglass that, once again, is way lighter than steel panels. The front brake discs are also partially made out of aluminum, which reduces another 4.4 lb from its total weight. No wonder why the carmaker has managed to save a huge weight in the end! Mid-engine, rear-wheel-drive 4C is Alfa Romeo’s first mass-produced supercar that returned to the North American market in the 21st century. The automaker introduced 4C introduced to the US and Canadian markets, after Alfa Romeo’s 30-year hiatus in North America. Powered by a 1.7 liter and 4-cylinder turbocharged engine, Alfa Romeo 4C boasts 237 horsepower motor, which is quite impressive. According to Supercars.net, the car can achieve a 0-60 MPH in just 4.4 seconds. Featuring the Alfa DNA dynamic control selector, Alfa Romeo 4C gives drivers the opportunity to select between its four modes: Dynamic, Natural, All Weather, and Race Mode. Ready to pick your favorite mode? Alfa Romeo and Maserati have joined forces to bring to life this high-performance sports car. “The Alfa Romeo 4C developers have combined the best technical and manufacturing competencies of two brands: Alfa Romeo and Maserati. Thanks to the internal synergies of the Fiat – Chrysler Group, the two carmakers were able to collaborate from the perspective of integrating Alfa Romeo’s design roles and Maserati’s manufacturing functions,” according to Alfa Romeo press release. Modena is well-known as the birthplace of some of the most famous sports cars. So where better to manufacture this affordable supercar than Modena, which combines tradition, passion, and technology into one driving force that creates great cars? Every 4C is hand-made and road-tested for at least 40 km by an experienced test-driver before it goes for sale. As with most prestigious supercars, it is no surprise that Alfa Romeo has its own team of test drivers. These experts test drive every single car for 40 km before they call it a finished product. If this car wasn’t cool enough already, every single 4C is built by hand during a 6-week time frame by the master craftsmen that have over 500 hours of training time before they are allowed to start using the tools on their own. 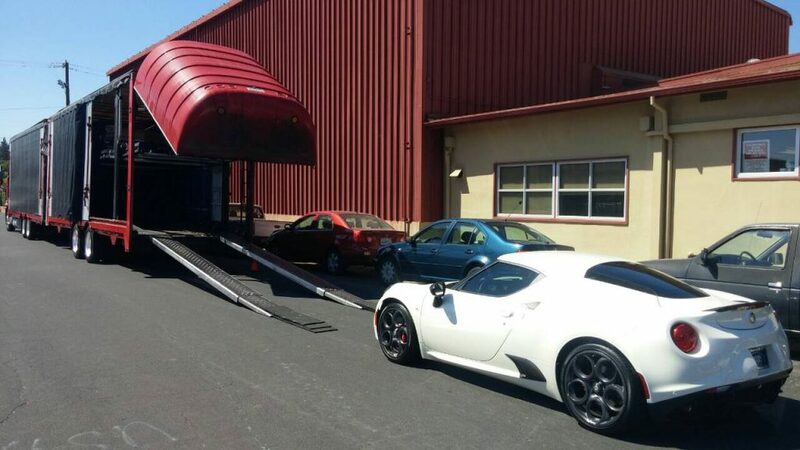 To transport such a precious sports car, you need to be extra cautious and carefully pick an auto-transport company that is trustworthy and will offer you a white-glove service. When we refer to white-glove service we mean the service that goes above and beyond the standard expectations for vehicle delivery. And although Corsia Logistics offers exceptional services to all its customers, classic, luxury, and sports cars, like 4C, require extra care. Only a company that specializes in white-glove service can offer you a premium experience. When it comes to delivery, your car will be shipped in an enclosed carrier trailer that shields your vehicle from potentially harming weather and road elements. The main tip that we give to all our readers is to choose a company that offers fair prices, great customer support and has great reviews. Here at Corsia Logistics, we make sure to always take great care of all vehicles we ship, no matter how long or short the distance is. But don’t just take our word for it. We invite you to go through Corsia Logistics customer reviews and see for yourself how our customers feel about the services we provide. We love what we do and we’re always ready to go an extra mile to make sure our clients’ auto transport needs are met. In case it’s your first time hiring an auto transport company, don’t fret. Hundreds and thousands of people have to transport their car every day and they are also new to this. Whether you are shipping your car from Los Angeles to Miami or anywhere else in the U.S., Corsia Logistics will be happy to help. If you need to learn more about the car shipping process, the white-glove service, or have any other questions, feel free to give us a call. Corsia Logistics vehicle relocation experts will be happy to walk you through every step of the auto transport process and make sure your car reaches its destination safe and sound.